Description: Parked at Clinton, IA. 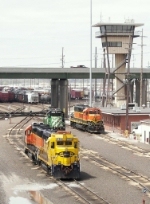 Description: Power of various origins is seen at one of the Argentine Yard Towers as viewed from the South 42nd Street Overpass. Description: A former GP35 leads the "slot machine" past 35th Ave. Description: This train had passed me several hours before out at Big Willow Park in Minnetonka. During which I missed getting it's fourth unit in my picture of it there. When I got back to Long Lake, lo and behold: there it was, stopped for a red signal on the main track! What a sweet second chance it was. One I made the most of. Description: I did not expect four units on this job. Resulting in my missing the last unit in this lashup, an ex-Santa Fe blue-and-yellow GP. Or so I thought ... We are in Big Willow Park here. Minnehaha Creek flows under the bridge the train is crossing. Description: Another view of the train that I saw beforehand in Minnetonka. That ex-ATSF GP35 was a honey of a find. Rare to see them on a class 1 as opposed to a shortline these days. Description: BNSF GP38-2 2034 leads L-CHI102 through Coal City. Description: My camera was givin me crap today and didnt know if it would save the pic so I took it early. Description: L-CHI8121 the LaCrosse to Savanna, IL local. Description: The SWEET power for BNSF's La Crosse to Savanna East Local. Description: BN caboose, MOW stuff, a blue unit? I like! Description: One of the 5 geeps in the little yard at Barstow. Description: BNSF 2034, BNSF 553, BNSF 8629, & BNSF 6619 lead L-SPR6589-19 through Litchfield IL. Description: BNSF 2034, BNSF 553, BNSF 8629, & BNSF 6619 lead L-SPR6589-19 through Litchfield, IL. Description: BNSF 2034, BNSF 553, BNSF 8629, & BNSF 6619 lead L-SPR6589-19 out of the siding at Litchfield, IL. Description: I thought this would finally be the day Id get it leading in my hometown.... NOPE!